THE ANSWER COULD SAVE YOUR LIFE. HALF OF ALL WOMEN HAVE DENSE BREAST TISSUE, DO YOU? 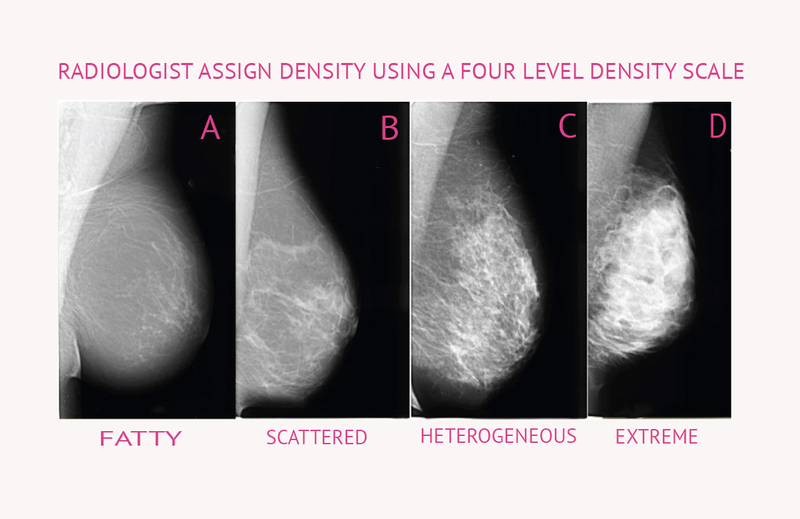 Breast Density is determined by the tissue differences of the breast. Fat does not show up on a mammogram, but fibrous and glandular tissue, or dense tissue, shows up white, as does cancer, making cancer hard to detect. 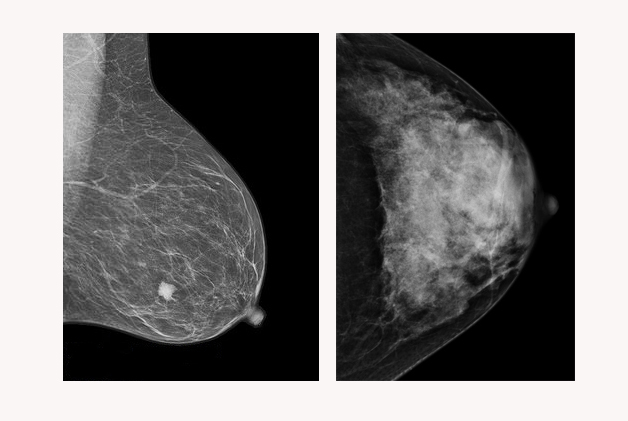 The photo on the left is a mammogram of a very fatty breast with a cancerous tumor. You can see how easy it is to spot. The mammogram on the right is of a an extremely dense breast. It is easy to imagine how hard It would be to detect cancer in this image. Approximately 50% of the women in Iowa have dense breast tissue. Are you one of them? Chances are you don’t know. Dense Breast tissue cannot be felt by you or your physician. It can only be determined by visualization on mammogram. In women with extremely dense tissue, cancer is 4-6 times more likely than in women with fatty breasts. Dense breast tissue is a stronger predictor for breast cancer than family history. Dense tissue shows up white on a mammogram- so does cancer, making it difficult to detect. In dense breasts, mammograms will miss 50% of cancers present, delaying diagnosis. Find out if you have dense breast tissue by contacting your mammography center. In many cases, your physician may not know. A and B are considered fatty or not dense. C and D are considered Dense. If you find out you have heterogeneously dense or extremely dense tissue, speak to your physician about additional tests to your mammogram such as ultrasound, breast MRI, or MBI. Educate yourself on density and be prepared to advocate for yourself. There are many things we can do to decrease the risk of breast cancer including regular exercise, stop smoking, limiting alcohol, eating a healthy diet, and maintaining a healthy weight. Iowa's breast density inform law was signed by Governor Branstad on April 13, 2017 with an effective date of November 15, 2017. Information regarding breast density will now be included in the mammogram result letter mailed to the patient. Having dense breast tissue puts one at an increased risk for breast cancer. Having dense breast tissue masks cancer on a mammogram making it difficult to detect. Get involved - Help us spread awareness on breast density. Tell others, talk to your friends, family, and neighbors about the impact of breast density on screening mammography. 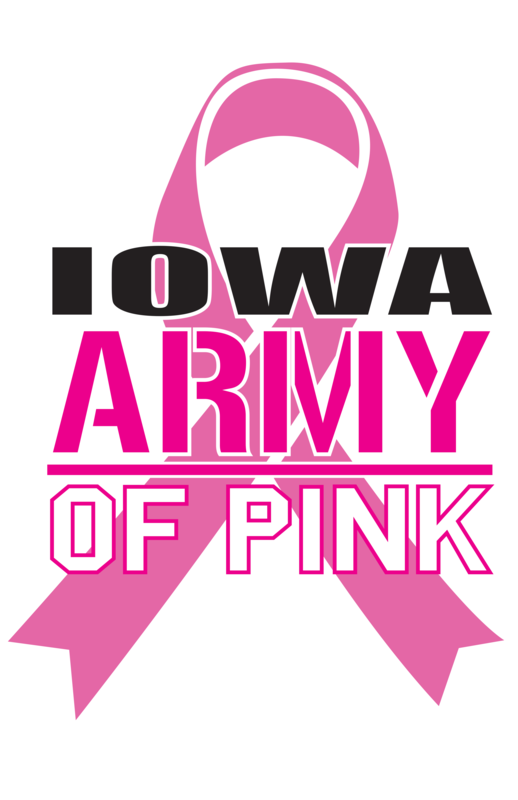 Help us spread awareness by joining Iowa Army of Pink - email us or join our facebook group. Comprehensive dense breast tissue resource for women and physicians. Regular mammograms are the best way to find breast cancer early. Link to medical CME for physicians, nurses, and radiation technologists. Dr. Robert Shreck provides CME through Des Moines University.